This was the opening line introducing Star Trek episodes back in the late 1960’s. William Shatner delivered these opening lines in such a dramatic fashion and you can still hear it on Netflix or other sources that stream the original series. I still get chills and a sense of wonder at that opening line, with the Starship Enterprise (NCC-1701) sweeping through the star field of the final frontier. But, just what is the final frontier? Expansion into space, just interplanetary space, will take generations. Expansion into interstellar space will take longer and require technology and systems that do not yet exist. Much like the expansion from Europe to the Americas took a few hundred years. Then, young people could just hop on a sailing ship and leave for parts unknown. Adventure and exploration were as close as the nearest seaport. Privatization of space flight may make access to that final frontier more accessible after it becomes more common. But a young person will pay a high price for access. That includes physical and mental training, financial backing, and knowing a return to Earth isn’t in the cards. Until the price of access gets to the equivalent of cross-country airfare, space travel for colonists (for lack of a better term) will be one way. Other aspects may also influence the one way nature of space expansion. Physical changes in our bodies may make it difficult, if not impossible, to return to Earth. Zero gravity on spacecraft contributes to bone loss. Lower gravity on, say Mars, will change our skeletal and muscle structures over time. Environments in closed systems like spacecraft, orbital stations, and surface habitats will keep our air and water sanitized. Because of this we’ll lose our ability to ward off allergies, disease, and infection. Returning a long-term colonist (or second- or third-generation colonist) to Earth could become a death sentence. Now, there’s a writing prompt. Earth becomes the place convicted space pirates go to die horrible, painful deaths. Current and past science fiction bypasses those inconvenient issues by using “gravity plating” that generates a constant gravity throughout the spaceship or space station. Most ignore the issues of bio-hazards with their people going on and off planets willy-nilly without proper decontamination, isolation, and quarantine. See the new movie Arrival for how those procedures might look with today’s tech*, or the series Star Trek: Enterprise for how future tech might handle it. Sometimes, though, all that gets in the way of the story. Ryk Brown, author of the Frontier Sagas, uses the gravity plating and ignores the bio-hazards–among some other small details–but tells some great tales in his space operas. I’ll be honest and say that I love good space opera. Space opera reflects what we all wish the final frontier represents: the adventure, excitement, danger, exploration. We want to find new worlds, new civilizations. We want to see new things, new intelligent beings, vast star systems spread across alien skies. To go where no one has gone before. Star Trek (the original series), the lunar landing and Apollo missions, seemed to herald a great jump into–at least–interplanetary space. But the effort died, and that is often blamed on the shuttle accidents. Sometimes, I wonder if the effort died because we didn’t meet Klingons or Vulcans. We found ourselves alone in the local space. Meeting another space-faring race might have spurred us to greater effort. Today, we are on the cusp of a new effort to get a manned mission to Mars. Fifty years ago, I wanted to join NASA and be on a Mars mission because I though by the time I was ready, we would be heading there. Life got in the way. And, there was Vietnam. For crying out loud, we made it to the moon using nothing more than a four-bit computer, and human calculators. As it works out, we may yet make it to Mars, but I can’t go. I doubt I’ll be around to see a permanent colony there. The dream still lives, though. *With the exception that vaccine injections–no matter the cocktail used–do not take effect immediately. A flu virus vaccine needs a week or two to become fully effective. Yellow Fever vaccines need a month or more to take effect before travel to a Yellow Fever location. New Kid, my first accepted short story, will appear in Neo-Opsis Science Fiction Magazine very soon. I just learned that issue #25 is at the printer and we should see copies soon. I’m pretty stoked. If you subscribed to the magazine after my post about the story’s acceptance, you will get it in the mail soon. I hope you enjoy it. I hope many folks enjoy it! Thanks for all the support. This is a little blatant promotion, today. The magazine that accepted my story, “New Kid,” is Neo-Opsis Science Fiction Magazine, out of Victoria, BC, Canada. The magazine’s publishing schedule has been a bit erratic of late, due to a number of personal blows in this family run operation. Normally, they publish three or four times a year. Still, they are surviving and will be shipping the next issue, #24, in the next few days. 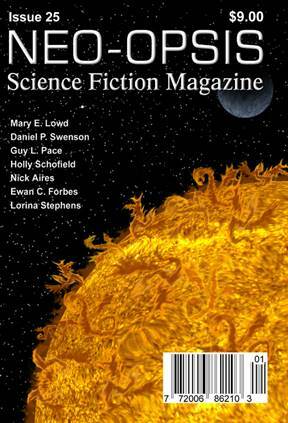 If you like good science fiction, you can buy a single copy, a three-issue subscription, six-issue, and up. If you want to catch my story (I don’t yet know in which issue it will appear), you would be making a safe bet by getting the three issue sub, starting with the current issue, or the next issue. I know, I’m promoting them and I’m being bit self-serving. Still, I want you to get a chance to see the story in print. I’m happy they chose it and found it good enough to include in their magazine. I did buy a short subscription when I submitted my story, and after reading through issue #23, I worried that they would reject me. The quality of the work is very high, much more so than you might expect in a market that is “semi-pro” pay. Thank you, in advance, for your support and know that I really appreciate it. I hope there are more blog entries like this and I can share more stories with you.